"I have so much gratitude for the power that this circle has given me and everyone in it. I picture myself as a spark coming into this training -- I think most of us felt like that. But now all I see are strong burning warm bright fires." The Turbodog Yoga 200hr Teacher Training is a comprehensive program for both students aspiring to become yoga teachers and for experienced teachers interested in expanding their skills. Turbodog Training will immerse you in self-exploration! Individuals seeking a deeper connection to themselves and to their practice will find great fulfillment, even without an immediate desire to teach. Our curriculum is taught over 10 weekends and meets the requirements for Yoga Alliance certification. The training turns avid students into excellent yoga teachers so that they may become powerful healing influences in communities around the globe. We believe that a combination of in-depth technical skills, along with deep personal discovery and growth, are the foundation of a compelling and effective yoga teacher. You can expect to undergo a process of transformation and personal expansion like no other, and you will emerge with a level of skill that will separate you from the crowd. Steve & Talya take the utmost care in creating a nurturing and safe environment for you to dive into the process of learning. You will be encouraged to embrace and embody your authentic self, as that is how you will deliver your gifts to the world. Having a consistent & frequent practice is essential to being a good teacher. Each day we meet, Steve & Talya will lead you through a 2 hour practice. You will also be encouraged to attend ongoing classes alongside cultivating a personal practice. Only by doing yoga can you connect to its true healing powers. And only from your personal experience can you authentically share the magic of yoga with others. During our afternoon sessions you will learn how to teach using all of you: this includes (but is not limited to) your voice, your body, your hands and your heart. You will have the opportunity to teach actual students as well as your fellow trainees. Steve & Talya will be your allies, giving you feedback and guiding you towards your most compelling and inspiring self. Your job is to make this process your priority and do your best. In our time together you will learn how to sequence safely for all levels of students, how to expertly modify and work with injuries, how to work safely with pregnant students and how to provide delicious and effective hands-on assists. You will also gain an understanding of how the body works and how to teach in order to open your students - physically and emotionally - so they can live healthy and rich lives. Throughout our time together, we will use a variety of indigenous ceremonies, including shamanic work, Toltec practices, energetic healings and more, to help you shed and mend the unworkables in your life so you can bring forth your full potential. These rich processes are profound teachers that also bring forth a richer understanding of the human condition, an essential quality in any meaningful yoga teacher. Our integrated Anatomy Course will give you a framework to understand the human body in general and how it is affected by yoga in particular. The knowledge gained during this course will give you confidence as a teacher and will be instrumental to your skill-set. Yoga is a business. As part of this teacher training you will learn how to make a living as a successful yoga teacher. Everything from how to position yourself within the market and to prospective employers, to how to retain and grow your student base, to how to get and negotiate private clients, will be covered in this training. You will leave excited and prepared to begin your business. Our trainees are responsible adults enrolling in this program from a place of choice. Our expectation is that the level of dedication we are providing to you be reciprocated. That you do your best at all times. That you commit yourself fully to this process and make room for the possibility of real growth and transformation. That you bring your highest self to this work and hold yourself accountable and responsible for your choices -- we will. To receive a graduation certificate, you will be responsible for 100% attendance and assignment completion. 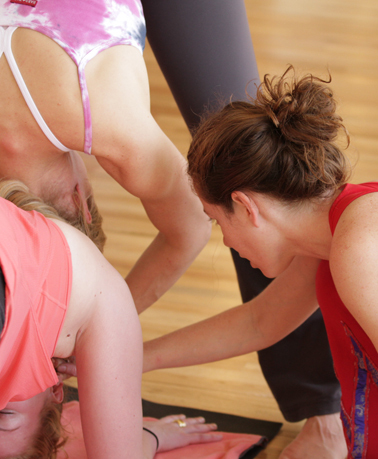 Not all yoga teacher trainings are created equal. We specialize in transformation. We know you’ve heard this before, but this is different. We offer a powerful, complementary combination of Native American spirituality and an asana practice that builds remarkable strength. It is a catalyst for growth like nothing we’ve ever seen. This is for people who want to create the best version of themselves as soon as possible, and then share their newfound gifts with the world. That’s why we call it Turbo-Transformation! If you’re interested in becoming a scholar of Hindu philosophy, this is not the program for you. The Turbodog training is experiential and practical. It is about using self-exploration to develop insights about yourself, in combination with specific, wildly effective tools that will make your teaching compelling and unique. You will emerge with a level of skill that will separate you from the crowd. Aside from the quotes below, go to this page to read all the testimonials of all the people who have come through our training who have never been the same. How is this training unique? Why is it different from other trainings? We create absolutely amazing yoga teachers. We take our students on a journey that includes daily ceremony to honor the sacred, alongside deep asana practice. The Native American rituals help us identify weaknesses, physical and emotional, and transform them into sources of power. Students develop a tremendous amount of resilience and an ability to speak from a place of experience. These are essential tools for being a powerful teacher. We will teach you how to teach this. Our style of yoga is unique, embracing yoga tradition and the latest understandings of physiology to obtain meaningful results. It is designed to address the challenges of modern life. What can students expect to gain from this program? You can expect to graduate with a sense of pride and confidence, knowing that what you offer is deeply effective and truly unique. Our students emerge with the tools to take their own students on a healing journey that will change lives. fears, and walk through the process of unraveling that which holds you back, and seizing that which you most desire. "Right after I graduated from the Turbodog Yoga training, I was in New York and went to several reputable yoga studios to try them out. Their classes didn't compare- I immediately became aware of the quality of my training and was fascinated by how much I learned throughout the process. I could teach and speak about the poses in a much more compelling way than other teachers who had years of teaching experience, and I had a deeper awareness of how each pose impacted the body. I had the tools to lead a class that was more meaningful to students. I was shocked, but in a positive way. I realized just how powerful our training was." "I found inspiration in myself. I found the strength to love myself. I was able to take off the glasses I was wearing and to see the world in a different way and I now live more open and more free. I am so grateful for the chance to realize that my life is important and special and meaningful." "There are not a lot of settings in our lives where we can openly express ourselves and our pains and still feel safe. I am so grateful to have been able to release all that. It is such a great relief. I've grown so much over the past two months -- it's like night and day. I don't want this to end, even though I know this is the last day..."